Fig. 1: Simplest case The example shows the basic usage of input/output variables. They can normally be used like normal C-style variables. 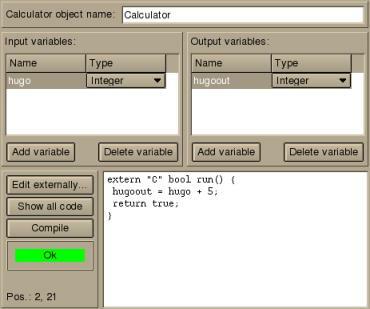 In the example 5 is added to the input variable hugo and assigned to the output variable hugoout. Fig. 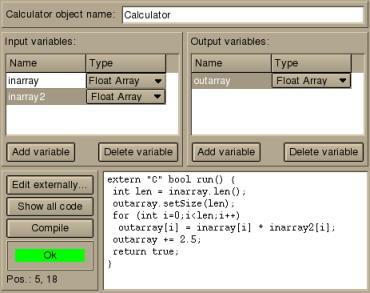 2: Array variables In the example the elements of two floating point array input variables are multiplied and assigned to an output variable array. The command outarray.setSize(len) can be omitted but this leads to a slow down as each time a nonexisting element is addressed the array is extended. After that to each element of the output array 2.5 is added. The +=, -=, /=, and *= operators apply the operation to each element of the array. The example is safe: if the second array inarray2 is shorter than the first array inarray the second array is automatically extended and new elements are initialized with the default value 0.0. Fig. 3: String variables In the example is checked whether the input string contains a slash as last character which is appended if it is missing. If the string is empty on entry, it is set to "/.". 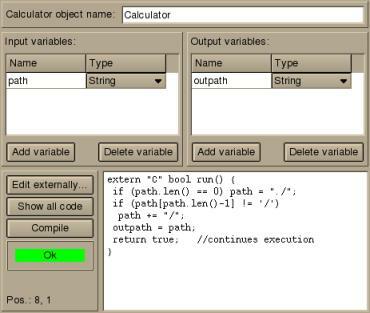 After the changes the string is passed to the output variable. The example demonstrates accessing single characters of a string as well as concatenating strings. int Argc; char* Argv; They contain exactly the parameters vfl's main function got at startup. The parameters have the common meaning that Argc has the number of parameters given at program start and the array Argv contains each parameter. The parameters are always "--exec" and "--link" when the execution of the GUI version is started.